Abstract from an article describing the visit of a high-level judoka (stemming from the first generation of Japanese immigrants in the United States) in Japan in the 60s. This judoka had the luck to meet Masters Egami and Ueshiba. 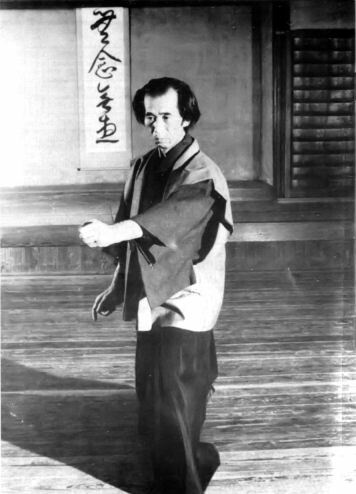 "The person who made the biggest impression on him was a professor of karate who was called Shigeru Egami. Egami, as describes by Nishioka, is a quite serene man. He is very advanced in the technique of karate, he is powerful, of an almost invisible speed and he can accept any push or blow without yielding, but his most big qualities live in the world of the spiritual, combined product of karate and meditation. So during a part of the training, in its Dojo, the students have to align themselves sat, eyes blinded. The sensei (teacher) is held in front of them with a bokken (a wooden sabre) and attacks them at random. Eyes blinded, they have to anticipate when it’s their turn and avoid the attack, and not stumble when it’s not their turn. Egami can realize it eyes blinded better than whoever would make it eyes wide opened . According to Hayward (Nishioka), Egami, a young man of around thirty years, was relaxed and friendly with his students. One night, after an evening at the Dojo, he slept at the edge of the tatami. « Somebody in the room must have decided to jump on him », says Hayward, « because he laughs and without opening his eyes he says « oh no you should not, I am not drunk!" He tells a similar history. A judoka friend of his debuts came in a school of aïkido in Tokyo to see what was this kind of Zen ju-jitsu. He was invited to come on the tatami with the other students. The founder and the master, Morihei Ueshiba, a man of about eighty years with a long white beard, was in front of the group and repelled attacks of the students one after the other. At the moment the judoka decided that the old man should not be too difficult to throw, the old man turned around and made him a sign to make an attack. He hurled himself forward and sent a blow, and felt nothing, no blocking, no opposition, no old man, but he flew in the air and fell again on the buttocks approximately ten feet farther. When he looked behind the old man had left. He looked again and left. Having thrown him, the old man had just taken place behind him. Just when he looked behind, the old man went out of his field of vision, just when he looked on the other side the old man moved on the other side. The effect made him invisible. "I spoke with master Ueshiba," said Hayward, "and I swear that he could read in my thoughts; he seemed to know what I was going to say before I say it." Others had the same experience.